In this article, I will cover a few methods to check if an antivirus is working fine or not. Viruses are the major threat to the digital information. A virus can infect data files, boot sector of a hard drive and cause system failure. There are several types of computer viruses that can manipulate and corrupt data. In the WannaCry cyber-attacks, a malicious worm is used to manipulate and wipe the data of infected systems. Anti-virus programs are used to guard a system from viruses. The programs automatically detect a malicious file and remove it from the system. The whole system depends on an antivirus program when it comes to viruses and malicious files. So, it is wise to make sure that an antivirus is installed properly and working. How to Check if an Antivirus is Working Properly or Not? EICAR test file is a computer file developed by EICAR (European Institute for Computer Antivirus Research) is designed to test antivirus programs. An EICAR file contains a string of 68 characters arranged in a specific order. This file is set as a verified virus in the antivirus programs. When a computer program detects this file on a system it raises the security flag. You can create this file in Notepad and use it to test your antivirus program. Simply paste the following string in the Notepad and save it with an EXE or COM extension. If your antivirus is working fine then, it should automatically detect this file as a thread and remove it from the system. If not, then you have to check your antivirus program. See if the real-time protection is on and all the protection settings are turned on. COMODO Leak Tests is a computer program which you can use to test the antivirus program. This program is developed by a security company COMODO well-known for their antivirus (COMODO Antivirus). 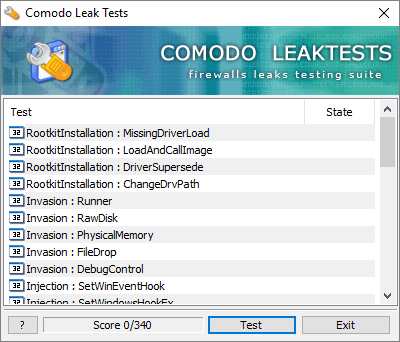 COMODO Leak Tests checks the HIPS programs and firewall for leaks. Nowadays, antiviruses have behavior analysis functionality. They monitor the system and check if the behavior of any program can pose a security risk. COMODO Leak Tests performs several tests that might be considered as a security risk and trigger the antivirus program. This way, if your antivirus is working, it will flag the COMODO Leak Tests and block it. As of now, COMODO Leak Tests is removed from its server but you can still download it from here. Trojan Simulator is another program you can use to check your antivirus. This program adds a startup entry in the registry and runs a harmless file in memory. In other words, it mimics how an actual trojan works without affecting your system. An antivirus would detect such behavior and flag it as a security risk. You can download Trojan Simulator from here. These are a few simple methods to check if an antivirus is working properly or not. Apart from these three, there are many other tools and methods to test the antivirus. If your antivirus also provides online security, you can try visiting malicious websites to test it out.